How often are you open and willing to reinvent yourself? Renewal is an important part of your life force. It gives you the ability to keep a positive spirit and help you embrace life with more ease. What happens when you don’t renew? Your life becomes predictable, your energy drops and your enthusiasm is not as high as it could be. You become more reactive and more rigid. The renewal process is like the creation of a collage. At the beginning it does not look good. You have no idea where you are going and you may even wonder if doing a collage is a good idea; it seems chaotic. 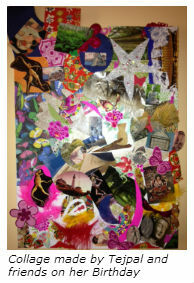 As you keep going, your collage becomes alive and you get more energized. Eventually something quite amazing appears. The renewal process breaks some of your habits. You also don’t know what you are rebirthing into. The only thing you know is that you will have a deeper relationship with your true self, more flexibility and less attachment. What are the key elements for renewal? Many spiritual traditions have unique methods to help a person going through the rebirthing process. The first step is often a clearing at the physical, emotional and mental level. At the physical level, you may want to change some of your nutritional habits or do a fast. At the emotional level you may want to release some feelings that have been stuck within you for a long time. At the mental level you may want to use the power of breath to clear your mind. What do you want to clear at the physical, emotional and spiritual level? As you read this News Letter, answer this question now, don’t wait. Also to get used to the rebirthing process, do a collage with a few friends as I did for my birthday a couple of weeks ago! How vibrant do you want to be? How much renewal do you want to experience?